The Vietnamese government and Formula One organisers have struck a deal to host the first Vietnamese Grand Prix in Hanoi in 2020, three sources with direct knowledge of the event told Reuters. Details of the race, including the planned construction of a racing circuit on the western edge of the Vietnamese capital would be made public on November 7, the sources told Reuters. Both Vietnam and the sport's former commercial supremo, Bernie Ecclestone, have said that a race looked likely, but no deal has been officially announced. Vietnam is a growing market for sponsors such as brewer Heineken and would be a fifth Asian race on the calendar, making up for the departure of Malaysia. 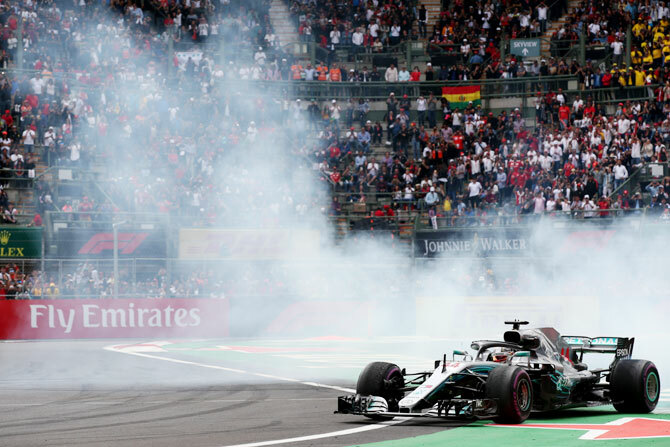 Formula One is not yet popular in Vietnam, although sporting events or competitions in which the national team does even marginally well are widely watched, and passionately celebrated. In scenes reminiscent of a revolution, thousands of people took to the streets of Hanoi in August to celebrate an otherwise minor even in international football -- a 1-0 victory over Syria in the Asian Games quarter-finals in Indonesia. The news also follows the launch of Vietnam's first homegrown car brand, Vinfast, at the Paris Motor Show last month. A unit of Vietnam's largest conglomerate Vingroup JSC, VinFast is set to become the country's first fully-fledged domestic car manufacturer when its first production models built under its own badge hit the streets next August. The Haas Formula One team lost on Friday a bid to overturn a stewards' decision that excluded French driver Romain Grosjean from sixth place at the Italian Grand Prix in September. The governing FIA's International Court of Appeal upheld the original decision and confirmed the exclusion a day after a hearing in Paris. The court said a detailed explanation would be issued at a later date. The US-owned team expressed disappointment with the outcome. "We simply move forward and look to the final two races of the year to continue to fight on track, earn more points and conclude our strongest season to date," said team principal Guenther Steiner in a statement. Ferrari-powered Haas are fifth in the constructors' championship, 30 points behind Renault, who had questioned the legality of the floor on Grosjean's car at Monza. The Frenchman's result, worth eight points, had put Haas ahead of Renault in the standings but his exclusion dropped them back to fifth. Renault argued that Haas had not complied with a technical clarification issued to teams in July, and presented photographic evidence to back up their argument. "Technical Regulations -- especially those introduced for safety reasons -- must be observed strictly," said Renault chassis technical director Nick Chester, expressing satisfaction with the decision. Haas have ruffled feathers in Formula One by striking a close technical partnership with Ferrari and contracting out as much as possible, allowing them to be competitive with fewer staff than rivals, who design and build everything in-house. Was Messi going to join Man City if Catalonia ceded from Spain?